Subordinate – me? From Woman’s Own to Jarrolds. Pat worked as a secretary for Woman’s Own in London where, aside from her secretarial duties, she was often called in to do some modelling. Following this, Pat worked for the Greek shipping company Adelphi Vergottis and the Spanish company Sigma Sewing Machines. 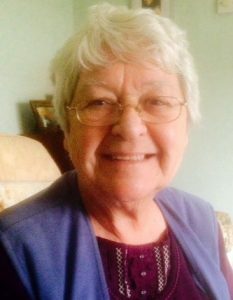 After moving from London to Norwich and starting a family, Pat carried out secretarial work at various local schools. She went on to work in the Enquiries Office at Jarrolds for around ten years. Pat’s last job before retirement involved working for South Norfolk Council in the Cleansing Division. For my very first job in the fifties, I worked as a Saturday girl in Woolworths. I was terribly good at adding up, and so when it came to Christmas I was always put on the Christmas card counter ‘cos I could add up quickly. In those days we didn’t have cash registers, you only put in the total amount. But I was a good ‘adder upper’. Then, on one of my school holidays I went to work in the Co-op accounts office. Sugar was still on ration in those days, and I was terribly shy as well – not like me! When it came to the tea, they asked me if I’d brought my sugar and I went, ‘Oh, no, I don’t take sugar!’ And I’ve never taken sugar since! I must have been about fifteen at the time, but it was great fun and the people were absolutely lovely. From here, I went on to my first permanent job at Woman’s Own up in the West End – I lived in the East End of London. My uncle was in the union there and in those days the unions were closed shops, so you could only get a job if you knew someone in the union. This was Woman’s Own, the very well-known women’s magazine. On my first day, I walked in as a very shy and innocent young girl. One of the secretaries had a tantrum and she threw her chair through a window. We were four stories up, so it’s a wonder nobody was killed! And I just thought, oh obviously that’s what people do! I didn’t know. But I worked at Women’s Own for nearly five years, always as a secretary at various departments. In the Art Department, they would often say something like: ‘Right, we’ve got an artist in who’s illustrating one of the stories – Oh Pat, could you just go down to the studio, he needs somebody to sit for him whilst he gets a rough idea of how to illustrate the story he’s going to run.’ And then there were things like, ‘Oh we’re doing an article from a nightclub, Pat would you like to go and get a couple of the girls and grab a taxi and go over to…’ I can’t remember the name of the nightclub; there was a really famous one we were sent to, but I can’t remember where it was now. And so we spent the afternoon sitting at the table pretending to drink. I have no idea why, but one time they wanted us to have our legs photographed. So we all toddled down to the Strand and stood there with our high-heeled shoes on and having our legs photographed! It was great fun. I’d come straight from school and I had absolutely no idea that my office was different to what everybody else in the world was doing. I thought everybody worked in an office like I did. The man who was the Fiction Editor always had the most wonderful perfume on his desk, so we always used to nip in and have some of his Chanel No. 5 which you couldn’t buy in this country in those days. But he was French and we liked his Chanel No. 5, suddenly everybody wanted to go and be friends with Robert! I was working for Woman’s Own when Covent Garden market caught fire. Our office actually overlooked the market. Suddenly, there was a rush for the phones, nobody was ringing the fire brigade they were all ringing the national papers to say, ‘This is my name, give me the by-line, this is my story!’ So poor old Covent Garden burnt down but we got lovely stories out of it! The agony aunt was in the office with us. When I worked in the Correspondence Department, if the agony aunt didn’t happen to be in the office at the time and somebody needed an urgent answer to a problem, it’d be one of us young girls answering. Isn’t that dreadful. It was tricky knowing what to say to the lady whose husband was having an affair: ‘What shall we tell her, shall we tell her to leave him, what do you think?’ But I mean, we were 17 and 18-year-olds. We hadn’t got a clue about life. Girls nowadays are far more mature. We’d all come up straight from school and we thought, ‘Oh this is a laugh, isn’t it!’ As far as I know, we were never rumbled. My boss got a bit difficult when I married, I’ve got a feeling she had a bit of a fancy for me. She was quite a well-endowed lady who was always spilling coffee down her bosom and she used to say to me, ‘Oh Pat do come and wipe me down.’ But I worked in a room with all the art boys facing her you see and they loved it, they’d be in hysterics with me wiping her chest! But she’d gone a bit peculiar when I got married and I thought oh I can’t take any more of this, I’m going to leave. It was London in the fifties – you could get a job in five minutes. I went to another company called INASCO, a little foreign metal company. However, they only lasted a year in London as they decided it wasn’t worth the business wasn’t worth it. So I went in the day the door opened and left the day the door closed. Great fun, loved it. From there, I went just a few short steps up the road to work for a Greek shipping company, owned by one of these iconic Greek shipping millionaires. The company was called Adelphi Vergottis. In those days, the uncle of the company was at loggerheads with Aristotle Onassis over Maria Callas. They both adored her but I think Aristotle Onassis had more money than Uncle Panagis so he won! With this Greek shipping company, we used to get 200 cigarettes a month that came in on the ships when they docked in London. I didn’t smoke but my dad liked it. One time, we each got an enormous can of olives. None of us had ever had olives in our lives, hadn’t got a clue what they were like, but it was my brother’s 21st birthday coming up and I thought, oh I’ll keep them for John’s birthday! So we go to open the olives and we all thought yuk! I think they all went in the bin. So that was Adelphi Vergottis. I then went to work for another foreign company. I seem to have spent my life working for foreign companies! This time, it was a Spanish company called Sigma Sewing Machines. Again, delightful people and I loved it there. I told them that I had to get the train from Liverpool Street home every night, and that if they needed me to work, I would work all night, but if I’d nothing to do then I was going to leave about quarter past five to catch my train. So they said yes, fine. When I came into work the next day, there was an enormous row going on with the other secretary who spoke Spanish. I could hear, ‘La señora, la señora!’ It seemed that they were talking about me; I’ll tell you what you can do with your job, I thought. So I got called into the office and I said yes? ‘We’d like to make you assistant sales manager, with big increase in pay.’ Ah, oh alright then! Big climb down. We were right beside where they were building the Barbican, so it was all being demolished. Our Spanish boss didn’t trust English people at all, so either Janice or I had to walk across to the bank, across all the building sites where all the blokes were working, to get the weekly wages in cash. We then had to go to the Post Office and pay all the insurance stamps. We said you shouldn’t ask us girls to do this, you know we’ve got several hundred pounds of money, anybody could follow us. He went, ‘Oh you English, for goodness sake!’ It was one of those things that wouldn’t happen now, but we did it. I actually stayed at Sigma until I left then to have my oldest son. Kevin was actually christened in all sorts of beautiful Spanish clothes that they’d sent over from Spain for me so that was delightful. Following this I left, and so that was the end of my London working. I didn’t work for several years after that. Kevin was born in 1965, and we moved up to Norwich in 1968 when Alan went to work for Jarrold Printing. We’ve been in Norwich ever since, aside from a few months when we moved away and then came back. I worked part-time when the kids were tiny. For a couple of evenings a week, I worked at Nurdin and Peacock as an assistant. I then worked at Norwich Union when they were putting all the insurance policies onto computers — computers were just coming in, so you can tell how long ago this was. I did this for a few years and enjoyed it. Again, this was just evenings which was ideal because we were all young mums in those days. All the mothers that they employed had the school holidays off – you didn’t get paid for it, but you got your job back at the end of school holidays. I also worked at Blake’s Boats at weekends, that was another job I had. I did quite a few! I worked at Sprowston Youth Club for a while, which I really liked. The lady who worked there was with the Education Office and she said that if I could get someone to look after my daughter, there was a quick vacancy open for a school secretary at Woodside. Their secretary has been rushed into hospital. She said, ‘You’d be perfect there. It’s only going to be for a few weeks.’ So I took it up. Somebody across the road picked up Jo at lunchtime and looked after her until I got home. When it got to the end of the school year, I moved onto Sparhawk, which was an absolutely brand-new school. It had just opened the day I moved in. Oh it was super! I loved being with the kids; it was a little first school and they were lovely. But then we moved away to Dunstable when Alan changed his job. That didn’t last very long. Jarrolds phoned me one day and said, ‘Oh Pat, do you think Alan would come back to Norwich – we need him.’ And I said, ‘Yes, I think he would!’ So we moved back to Norwich. So off I went to Blackdale, and I was there a few years. I cried my eyes out when I left. At Blackdale I was doing about 30 hours a week and the Education Office said, ‘No sorry we’re cutting all the hours down, you’re doing fifteen.’ I couldn’t really afford to work fifteen hours. After that carrying on, I went to work for Looses in Magdalen Street. I have to say, this was probably the only job that I really didn’t like. It was so boring! I said to the chap, ‘You don’t need a full-time secretary.’ By about ten o’clock in the morning I’d got nothing else to do all day. I sat in this little back office with bars up at the windows and I couldn’t see out. One day, I got a phone call from the Personnel manager at Jarrolds who said, ‘Pat I understand that you might not be very happy in your job, wouldn’t fancy a job with us would you? Richard Jarrold needs a secretary.’ And I said, ‘Oh, certainly would!’ It was the middle of winter and it had been snowing; I’d gone to work in my old boots and my old fur coat that day. They asked if I could go across as they wanted to chat with me. So I went across in my lunch hour. I walked up Bridewell Alley where a whole awning full of snow fell on me! I was dripping as I walked into Jarrolds! I did take my boots off at the door when I got up to the office and put some shoes on. I went into see Richard Jarrold wearing this tatty old fur coat and he said, ‘Oh let me help you off with your coat Mrs. Willoughby,’ and I said, ‘Oh no, it’s fine, it’s fine.’ He said, ‘No I insist.’ So he took my coat off but it was only joined at the sleeves in the lining so he took the coat off and I was left with the lining!’ I was so embarrassed I didn’t quite know what to do! I said, ‘I’ll do it shall I?’ I was mortified! So I had my interview and I was sure that the poor bloke was thinking, oh my god I don’t want this woman! He then asked me to do a typing test, so I then began this. I was typing away on a manual typewriter when the carriage return shot right across the floor! So there I am picking up this carriage thing. He went, ‘Oh I think we’ll leave that shall we?’ I said to Alan, well forget that, they’re never going to hire me. But in the first post the next day, there was letter asking if I could start as soon as possible! I worked as a secretary at Jarrolds for about ten years and I had great times there. I was in the Enquiries Office and so we dealt with everybody. I was horrified at the shoplifting, I had no idea people shoplifted like that. You wouldn’t believe it! But we had some funny stories as well. The shoplifters were often brought to sit in our office until the police arrived and the number of people who fainted you wouldn’t know, and the number of people who threw their bag! Oh, you can imagine. But no, it was always great fun. I really liked working at Jarrolds but I eventually left as the hours over Christmas were getting longer and longer. They were talking about opening on Sundays and I did say to Richard Jarrold, ‘Well I won’t work Sundays because Sundays is the one day when all the family get together and I’m not missing out on that.’ So I left Jarrolds. So I went there for a few years and I think I liked that job better than anywhere. I was in the Cleansing division working with all the dustmen and the septic tank emptiers. Oh, they were super! The best blokes ever! We had such fun. We were out at Ketteringham, away from the council offices. We weren’t bothered by the council; we were far too lowly to be spoken to! So really that’s about it, I retired after this.